The first bit of business that got me onto this project were of course the descriptions from the novels, and the prominent part that Prince Imrahil plays in them. After Games Workshop released their version, I was sure I would have to do this project... I resolved to find a better version of the Imrahil and the Knights of Dol Amroth than GW had provided. Why were the GW figs so bad? So bad that I couldn't even bare the thought of using them? I guess it has a lot to do with the realism of the movies. Peter Jackson put a lot of effort into making those movies into 'historical' movies, and I certainly appreciated that. I don't think that GW really transfered that to their realization of the Knights of Dol Amroth. So what was it that gave me the idea to do a version of the Swan Knights that actually looked like this? Well, I was doing an Internet search and came accross this amazing painting by Anke-Katrin Eissmann. When I first saw it I was sure it was an Alan Lee painting. Once I looked into it I found that it was not Alan Lee, but that the actual artist was inspired by him, thus explaining the similarities in style. Still, I was seduced by Anke-Katrin Eissmann's imagery and longed to see that on the gaming table: They are simply realistic, but have a wonderful fantasy feel. You will also notice that the horses are not draped in robes, and are much more like those used by Gondor in the movies. Anke-Katrin Eissmann produced one of the best renditions of the Knights of Dol Amroth that I have ever seen. Still, I knew that I would not be able to find those exactly, and there were some things about them that I didn't want to do... I thought that, unlike the men of and all of the people of Dol Amroth for that matter, would have had close proximity to other humans: the Haradrim. Now surely, the Haradrim are apparently evil, but unlike orcs, evil or not, they would have wanted to have trade relations with the people of Dol Amroth. Surely there would even be border towns filled with people that claimed both ancestry to Dol Amroth and Harad. So, along with trade of goods, there would also be trade of cultures. I figured I would represent this by using cloth head wraps similar to the Haradrim, but have the wraps over helmets, which would be an influence of thier cousins to the north. The concept was complete, and I was ready to go to the next step. At this point I was happy to know a little bit about the era in Europe between 600 and 1100 (often called the Dark Ages). This period of history is actually the period that Tolkein himself was very interested in, and he even based a lot of his cultures on cultures that existed in this period, the most notable being the Rohirrim, which were closesly based on Anglo-Saxons of Britain... But I digress... The Normans also existed during this time, and the image by Anke-Katrin Eissmann most strongly reminded me of them. Furthermore, a bit after the Dark Ages, the first crusades took place, and the nights that fought there were virtually identical to the Normans. I also went with the Normans because their shield were not round; the Rohirrim were already mounted warriors with round shields, and I wanted to make the Knights of Dol Amroth a bit more distinct from them. Later I found Crusader Miniatures, which made a very good line of Normans, along with nive looking horses. They are a little more expensive, but worth that extra bit of pocket change in my opinion. But still later I found another line of miniatures that would work even better. Sculpted by none other than the Perry twins (who actually sculpted a large proportion of the Lord of the Rings line from GW). 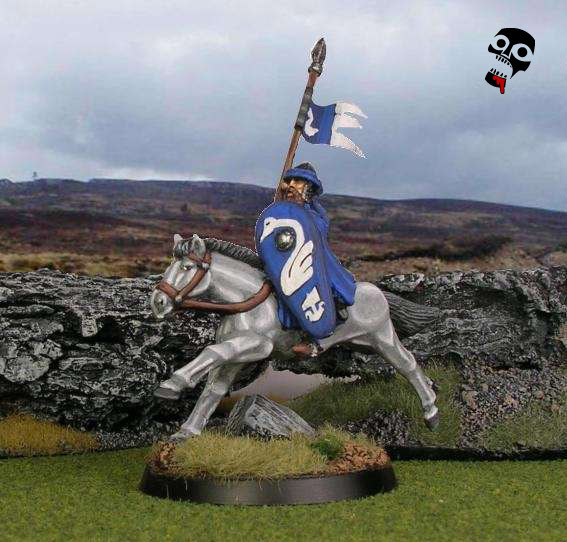 Perry Miniatures (the Perry twin's company) produce a beautiful line of crusaders from the first crusades along with horses that are not only fantastic, but actually look a lot like those horses of Rohan that you already have in your collection! Knights from the first crusades perched on beautiful horses from Perry Minitures! Upon looking around the Perry Miniatures first crusades catalog, I even found a perfect set of miniatures that would represent exactly what I was looking for! They have a selection of knights with Arab head gear that represents almost exactly what I thought the Knights of Dol Amroth would look like. So for those of you who want to go with that look and don't want to add your own greenstuff to make it a reality, I recommend buying these fantastic miniatures. I love the 'Arab' headgear on these Perry Minitures! I should also mention that each of the above manufacturers also sells dismounted knights. I didn't get any, as I wanted to see how well the concept would work before sinking too much time and money into it, but now that I am happy with the outcome I plan to. The other thing that I should mention is that these miniatures are a fraction of the price of the GW Swan Knights. For the price of one GW knight I can get about four Gripping Beast knights and three Perry Miniatures knights! The dismounted figures are even cheaper! I was also determined to find an alternative Prince Imrahil himself. Indeed I would have to, as I couldn't really use the GW version along side the miniatures I planned to use. I scoured the Gripping Beast line and found the El Cid character. He was probably the best Gripping Beast miniature I had ever seen, and he came with a grand horse and a few more miniatures, one of which I used as a knight of Dol Amroth, and the others could easily be used for Haradrim. Perry Miniatures offers a collection of mounted commanders which might work, although they lack the princely quality of Imrahil, not because they are poor sculpts or anything, but just because Crusaders are not knights of Dol Amroth. One final note: the miniattures are all made with pewter containing lead. What does this mean to you? Well, you should be very careful touching, filing, or cutting these miniatures. Furthermore, if you have small children make sure that they don't come near them, and keep them away from any paint, paint brushes, paper towels, or anything else that comes in contact with them. Lead is highly dangerous, especially for kids, so excercise extreme caution when dealing with them. The conversion of the Gripping Beast Normans that I used was quite simple. It is really a great project to allow people new to greenstuff to get a little more comfortable with it. The first think I did was roll out some thin strips of greenstuff. I soon realized after doing one head wrap that it is easy to roll the strips too thick. What I had to do to make sure that I made them thin enough was to first roll them to the width I thought would work, and then keep rolling them until I was sure they were too thin. That typically turned out to be perfect. Once the strips are rolled, wind them around the edge of the helmet to make a band. Once the band is in place, use a sculpting tool to flatten it a bit and put the folds in it that would be typical of that type of head wrap. I used the Haradrim miniatures as a guide for this, both the Haradrim Raiders and the plastics worked as good examples. Once the head wrap is in place, I wanted to have some fabric hanging down below the knot at the back. I placed a flat, semi-triangle shaped piece of greenstuff under the knot and sculpted in some folds. I was pretty happy with the outcome, except that they often looked somewhat static, and not really representative of a charging knight. To fix this I lifted up one side of the greenstuff so that it looked like it was flapping, which produced a nice effect. After they were all done, I let the greenstuff cure before moving on to the next step. I use Iron Wind Metals paints. They are my favorite, I don't really know why. This painting tutorial is loosely based on those paints, but a lot of the paint I use is actually mixed before use anyway, so there is really no way to match the exact colours I have used. Still, I hope this tutorial works more as a guide and less as an exact instruction manual. I started with the knight primed black. The first thing I do is base the miniature. Why? Well, I don't want to have to spend time carefully doing the base once the model is completely painted, so I do it first when I can be sloppy without worrying. I typically implement a construction line type of deal, working on at least six models at a time for mounted models and twelve models at a time for figs on foot, as it allows for much faster painting. The inked gray base coat, along with the first highlight. The first step after the base is coating the body of the horse with a slightly darkened Iron Wind Metals (hereafter refered to as IWM) Gray (yeah, it is just called 'gray'). Once the paint was dry, I watered down some IWM black (about 5:1 water to paint ratio) and painted it on as an ink. I don't use the GW inks, they are far too dark to work very well. Once the ink dries completely it is time to apply the first highlight, which is simply the same gray I used to base coat the horse. It is actually lighter than the inked paint that remains, but not too much lighter, so it acts as a good first highlight. I add the highlight by just painting lines or curves on the raised parts of the miniature. For this to work well, the more detail on the miniature the better. Unfortunately with these Gripping Beast miniatures there isn't a lot of detail as far as the horse's musculature goes. In cases like this it is best to look at reference pictures and freehand the highlights where you think the raised muscles should be. The next thing I did was blend the highlights. I do this because I want to get rid of that obvious line between the highlight and the base colour. Some people will deal with this line by lightening the highlight paint by such a small amount the the line is not noticable, but this is exponentially much more work for minimal difference in the final look. I blend the highlights by painting a 5:1 water to paint mixture using the highlight colour along the edge of the highlight. It may take a couple of coats, but this typically works wonderfully in blending, as you will see in images below. The second and third highlights are applied. I add some white paint to the mix, about a 2:1 white to gray ratio, and use that to add the next highlight. It should be noted here that it is better to whiten the mix less than more, because if you apply some paint that is too white it is likely you will have to start over, whereas if it is too dark, you don't need to start over, but simply lighten and re-highlight. I blended this highlight the same way I blended the previous. I then added another couple of parts of white to the remaining mix. I watered this down a bit (about 2:1 water verse paint) and just applied it as a highlight. By adding watered down highlights you reduce the need for blending. The main body of the horse is complete. Finally, I watered down some white paint with a 3:1 water to paint ratio and applied this as a final highlight to the very highest parts of the horse musculature. Once this was applied the horse was complete... Well, at least the main body parts. The tail, eyes, and hooves remain. The next thing I did was add the brown to the straps. I used IWM African as the base coat for that. I then highlighted it by adding two parts of IWM leather. A final highlight was applied by adding another two parts IWM leather. Instead of blending, I watered down the highlights slightly for the leather parts as the surface areas are very small. I was happy with the rich blue result! Next I moved onto the blue fabric. Basically all the fabric that could be seen, including the head wraps that I had sculpted, as well as the shields and flags, were painted blue. I used IWM dark blue as the base coat. IWM true blue was used to lighten the dark blue, first adding two parts, and then another two parts for the first and second highlight. Finally I added a little white to the mix, watered that down a bit, and applied that as the last highlight to finish. I used IWM steel as the base coat for the armour, using IWM metalic silver to highlight. And to finish, I painted the hooves dark gray, highlighting with IWM gray. So that was it for the basic painting of the miniature, and it was time to start with the iconography of the Swan Knights. There is really nothing to instruct on the iconography, other than to say 'use a steady hand to paint nice looking swans'... The only thing I can suggest is having a really good idea of what you want to paint before you start. It might be good to sketch out the design before you try to paint it onto the miniature. Also, it might be good to practice on some paper or another miniature before trying to paint it on the final figure. I used pictures of swans as well as boat images to practice before I went to the actual figs. It also helps to have a way to steady your hand, say by resting it against a desk or something. The last thing to do on the fig is to clean up the edges and all of your mistakes. This may be the most important thing as well; people's eyes seem to be drawn to even the smallest of little mistakes, so going back and fixing them is absolutely key. The way I fix most issues around the edges is by adding thin black lines. You can see this in the above image showing the blue painting. The black lines that seperate the colours really go a long way into making it look clean. I like to use black lines to seperate all of my colours. After that you are done. Enjoy! The fearless knights of Dol Amroth charge into battle! Prince Imrahil himself leads the charge! the others have. Instead, he has painted his helmet in alternating blue and white. as heavy spears. Here a knight skirmishes with a Haradrim Raider. Only in an age of wolves and shattered shields will the world of men fall!